Thoughtful guides in complex terrain. RedLegg is an innovative, global security firm that delivers managed cybersecurity solutions and peace of mind. Our agile team of engineers has been serving and defending clients’ information since 2008. Chicago-based and veteran-owned, we are trusted, personable guides in this complex, ever-changing, high-stakes field. We lead with confidence and take pride in instilling the same confidence in our clients and partners. We are trusted allies. Here to guide, defend and protect. HOW CAN OUR HANDS-ON SOLUTIONS SERVE YOU? RedLegg’s approach to cybersecurity consultancy is so unique, we had to name it ourselves. 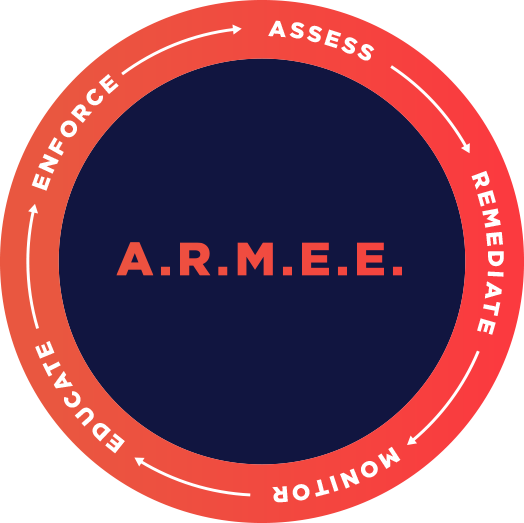 ARMEE (Assess, Remediate, Monitor, Educate, Enforce) applies a holistic, lifecycle approach to risk management. Veteran, engineer, specialist, strategist, thought leader, geek. With decades of experience & industry & community leaders at the helm, our ranks, clients & partners are in good hands.